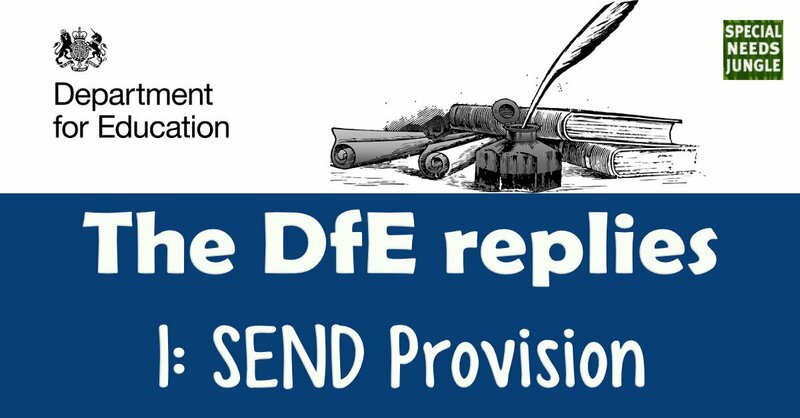 Last year, the Department for Education offered to answer SNJ readers' questions about SEND. It's not the first time they've done this, you can see the previous session in 2016 here. Once again, you sent your questions in, we grouped them into themes and put them forward and waited. And now, dear reader, the answers are here. Before we start, I'd like to send Patrick, who was in charge of answering your questions but fell ill, our very best wishes for a full recovery; I'm sure you will do the same. This meant an unavoidable delay, but other DfE SEND team members picked up the burning torch and thanks to Laura, Chris and colleagues for this. How is the Government supporting schools to improve their SEND provision? We know that the quality of teaching is central to ensuring that pupils with SEN and disabilities (SEND) are given the best possible opportunity to achieve good results and good outcomes. All maintained nurseries and schools (including academies and free schools) must have a teacher who holds Qualified Teacher Status designated as the SEN coordinator (SENCO). This teacher has responsibility for coordinating the provision for pupils with special educational needs. This member of staff must undertake the National Award in SEN Coordination within 3 years of taking up post if they were not a SENCO for at least 12 months prior to 1 September 2009. We have provided funding to a range of condition specific organisations to develop resources and training to equip the workforce on SEND. This includes specialist resources in relation to dyslexia, sensory impairment, autism, physical disability and speech and language needs. All the materials funded by the Department are hosted on the SEND Gateway, an online portal offering education professionals free, easy access to high quality information, resources and training for meeting the needs of children with SEND, including a new interactive ‘what works’ resource. We have recently issued an Invitation to Tender seeking bids to deliver a programme of work to drive education institutions to: prioritise SEND within their Continuous Professional Development (CPD) and school improvement plans; equip schools to identify and meet their training needs in relation to SEND’; build the specialist workforce and promote best practice; and identify and respond to any gaps in the training and resources available for schools. This builds on the work undertaken over the last three years to embed good SEND provision in schools using the SEND review tool. What is the Government doing to support children and young people with Autism? We want to ensure that education staff are well placed to support children and young people with autism. The Initial Teacher Training framework of content is ensuring that newly qualified teachers are equipped to support children with special educational needs, including those with autism. We are currently in discussion about extending our Autism Education Trust contract to deliver autism training to existing education staff in early years settings, schools and colleges. The Department has funded this training since 2012 and it has so far reached more than 150,000 people – not just teachers and teaching assistants, but also support staff such as receptionists, dining hall staff and caretakers, encouraging a ‘whole school’ approach to supporting pupils with autism. It’s also important that teaching staff can access resources to help them support children on a day-to-day basis in the classroom. We’ve recently published a new resource, developed by ASK Research and Coventry University, that sets out evidence on effective approaches to supporting children and young people with special educational needs, including those with autism, and gives examples of current practice in good and outstanding schools and colleges. It’s designed to help schools and colleges to apply the ‘assess, plan, do, review’ approach recommended in the SEND Code of Practice more effectively. What is the Government doing about unfair exclusions of children and young people with SEND? Our school exclusion guidance is clear. Exclusion powers should only be used in particular circumstances and decisions to exclude should be lawful, reasonable and fair. Head teachers should, as far as possible, avoid permanently excluding any child with an EHC Plan. Ofsted’s assessment of behaviour in schools includes specific consideration of exclusion, including any differences between groups of pupils and parents are encouraged to pursue the appropriate route of redress if they believe a decision to exclude their child has not been made correctly. We know that pupils with SEN are more likely to be excluded and the Prime Minister has announced a review of exclusions practice, focusing on the experiences of those groups who are disproportionately likely to be excluded from school. How has the Government worked to ensure that GCSE syllabus changes do not adversely affect pupils with SEND? The new GCSE and A level qualifications are the result of a long and careful process of reform that started in 2011, with a review of the national curriculum in England. This process has involved extensive consultation and the impact on pupils with special educational needs or disabilities was carefully considered. The Department for Education consulted on the equality aspects of the GCSE, AS and A level subject content and Ofqual consulted on its proposals for the assessment reforms to the qualifications. More information can be found here. In addition to the equality impact assessments, Ofqual also commissioned independent research, including a review of relevant literature. During the main period of reform, Ofqual’s Equality Advisory Group and Access Consultation Forum were consulted on the regulatory assessment changes. Ofqual continues to meet with equality groups to discuss the reforms including the National Autistic Society, Colour Blind Awareness, RNIB and RNID for example. Ofqual are currently in the process of evaluating the impact of the reforms. The work began in autumn 2017 following the summer’s first awarding of phase one of the reformed GCSEs and A level qualifications. As part of this work they will be talking to a range of stakeholders including: teachers, educational providers, teacher representative organisations, subject associations and exam boards. It is worth also noting that if a student is disabled (as defined by the Equality Act 2010) they are entitled to apply for reasonable adjustments. Exam boards have a duty to make reasonable adjustments for disabled students who, because of their disability, would otherwise be at a substantial disadvantage when demonstrating their skills, knowledge and understanding in an assessment. What measures has the Government put in place to ensure that the new Progress 8 attainment measures do not disadvantage pupils with SEND? In 2016, we replaced the 5A*-C at GCSE (including English and Maths) headline measure with Progress 8, which compares how much progress pupils make from the end of Key Stage 2 to the end of Key Stage 4 in comparison to other pupils nationally with similar starting points. By focusing on progress, schools are held to account for the performance of all pupils taking relevant qualifications, not just those at the C/D borderline, as every grade from every pupil, including those pupils with SEND, contributes to the school’s performance. Progress 8 encourages schools to offer a broad and balanced curriculum with an academic core, but it also allows students to study up to three high quality non-GCSE qualifications, thereby ensuring that they still have the opportunity to study a broad range of subjects that reflect individual interests. We recognise that this is an important feature for many lower attaining students, some of whom will have SEND. Analysis of 2016 performance data illustrates how Progress 8 is benefiting pupils with SEN. In 2016, 37% of SEN pupils achieved a positive Progress 8 score, compared to 20% of SEN pupils achieving at least 5A*-C including English and Maths in 2015. We have received some feedback about the disproportionate effect that a small number of extremely negative Progress 8 scores can have on a school’s average: for example, where a pupil who did well at primary school does extremely poorly in their GCSEs, compared to others with similar starting points, due to long-term illness in Year 11. This has created concerns that in a small number of cases some progress scores calculated for individual pupils can be so largely negative that they can distort the overall picture of performance for a school. We are refining Progress 8 and the primary progress measures for 2018 in order to reduce the disproportionate impact of the most extreme pupil level progress scores only. These pupils (many of whom will have SEN) will still be included in the progress scores, but the impact they have on the school’s average will be reduced. This change will relate to the progress scores of 1% of pupils nationally - normally no more than one or two pupils in any school.